Thanksgiving is gone as quickly as it came, and it’s on to a weekend of football. 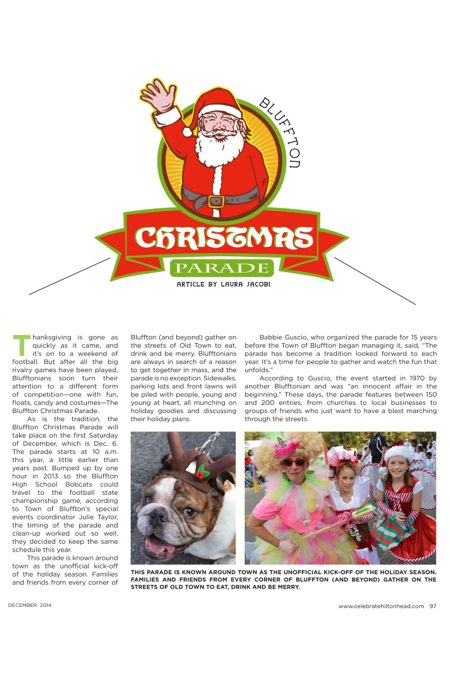 But after all the big rivalry games have been played, Blufftonians soon turn their attention to a different form of competition—one with fun, floats, candy and costumes—The Bluffton Christmas Parade. 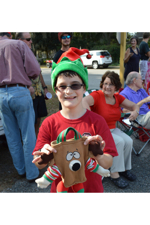 As is the tradition, the Bluffton Christmas Parade will take place on the first Saturday of December, which is Dec. 6. The parade starts at 10 a.m. this year, a little earlier than years past. Bumped up by one hour in 2013 so the Bluffton High School Bobcats could travel to the football state championship game, according to Town of Bluffton’s special events coordinator Julie Taylor, the timing of the parade and clean-up worked out so well, they decided to keep the same schedule this year. 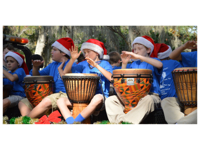 This parade is known around town as the unofficial kick-off of the holiday season. Families and friends from every corner of Bluffton (and beyond) gather on the streets of Old Town to eat, drink and be merry. Blufftonians are always in search of a reason to get together in mass, and the parade is no exception. Sidewalks, parking lots and front lawns will be piled with people, young and young at heart, all munching on holiday goodies and discussing their holiday plans. According to Guscio, the event started in 1970 by another Blufftonian and was “an innocent affair in the beginning.” These days, the parade features between 150 and 200 entries, from churches to local businesses to groups of friends who just want to have a blast marching through the streets. One of Guscio’s favorite entries was the “Bluffton Baby Brigade” she organized one year, in which dads joined the parade pushing their babies in strollers. Another crowd favorite is the “Drill Team,” which features women clutching power drills. The parade entries are a great example of the unique spirit of Bluffton, with surprises every year. Even Santa Claus makes a special appearance at the end of the parade, riding a fire truck so that his reindeer can rest up for the big night. “Bluffton is lucky to have an event where most of its residents gather every year and celebrate their collective eclectic personality,” Taylor said. Parade entrants can begin setting up at 7:30 a.m. The parade will start at Pritchard and Bridge streets and end at Red Cedar Street. The entire parade usually lasts about two and a half hours and will happen rain or shine. During the morning’s preparation and parade time, various roads will be closed, including May River Road from Buck Island Road to Bluffton Road and Pin Oak Street from May River Road to Oscar Frazier Park. The parade has become a tradition looked forward to each year. It’s a time for people to gather and watch the fun that unfolds. The parade entries are a great example of the unique spirit of Bluffton, with surprises every year. According to public information officer, Debbie Szpanka, the roads around the parade route are closed in a “rolling closure” pattern to maximize safety while minimizing the effects on traffic flow. “It takes the logistical coordination of an airport traffic control tower. However, when you see everyone having fun as a community, it’s worth all the spreadsheets, e-mails and meetings,” Taylor said.